After I returned from my driving experience it was now time to experience Vegas. I was hungry after I tried my hand at being a NASCAR driver so our first stop was going to be Cabo Wabo Cantina, located near the Planet Hollywood hotel. 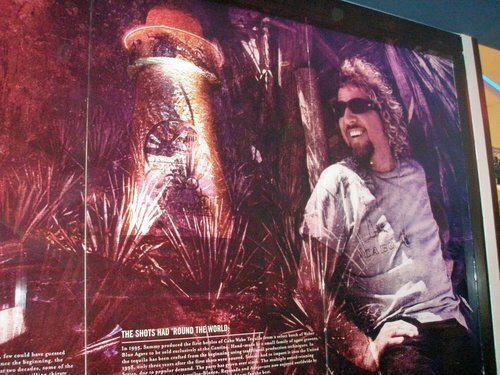 Cabo Wabo held a special spot in my heart, well not so much the restaurant, but Sammy Hagar, who founded Cabo Wabo in 1990. The Red Rocker had been a part of my life since I was a child as my mom was a huge fan. I had spent many years listening to his music as a solo artist and while he fronted for Van Halen. Although I preferred the days of Van Halen with frontman David Lee Roth, I still could not deny that I was excited to stop by the restaurant. My friends and I ordered up our Mexican inspired meals and a few margaritas. 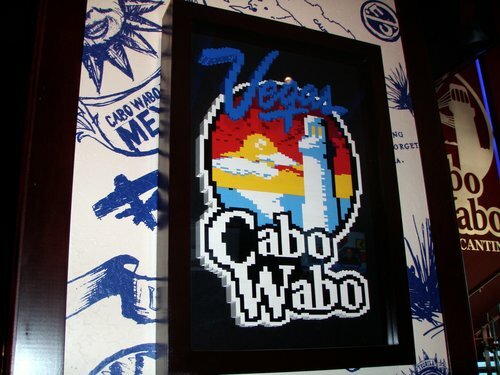 Cabo Wabo sign out of legos, yes please! After our enjoyable meal we proceeded on to the classic touristy things to do in Vegas, watched the fountains at the Bellagio, visited where Caesar did not live and stopped off at Serendipity 3 for a frozen hot chocolate. We tried our luck in the casinos as we wondered from one to the next. It appeared no one was lucky this day. The day had flown by and it was now dinner time. We found Sushi Samba in the Palazzo. Sushi is always a treat for me as North Idaho does not have a lot of sushi restaurants! 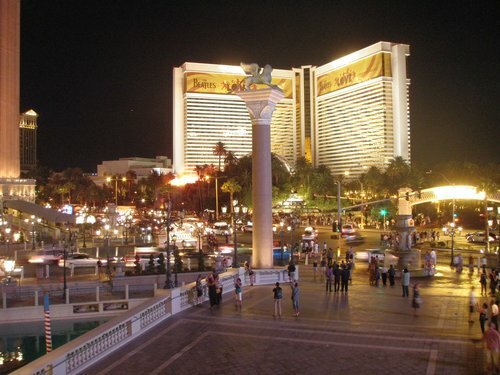 Once we finished our meal we walked back to our hotels along the enormously long blocks taking in the nightlife of Vegas. I was again reminded of my first visit to Vegas and seeing the guy with no shoes grabbing the beer from curb and drinking it. Although as a teenager I was shocked by that, now as an adult and not being as sheltered I realized it was not shocking at all. People were having a good time all over Vegas, there were drunk girls laughing and hanging on each other as they walked the strip barefoot with their heels in hand and intoxicated guys reenacting their favorite parts from The Hangover. It was the adult playground that Vegas had promised. 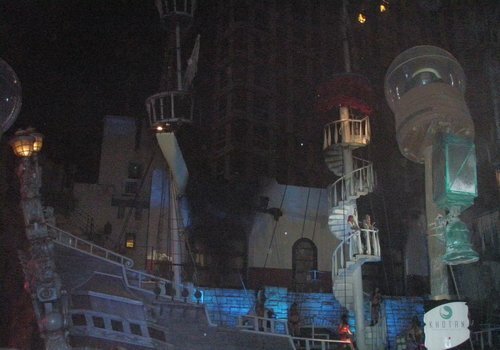 We stopped briefly at Treasure Island and watched the Sirens of TI, a pirate show in front of Treasure Island. It was a spectacle for sure and jammed packed with onlookers. The show was full of pyrotechnics, scantily clad women and obviously a great story line – well maybe not. Although this is free, I would not suggest this as a family friendly activity, however there is stroller parking and parental guidance is recommended. I do not remember anything too shocking, but I have never really felt Vegas was appropriate for children anyways. This is of course not everyone’s opinion as we saw many families lugging their young children around in strollers in the middle of the night. I even saw a family with two small children sleeping on a pubic transit bench, but who am I to judge? After we finally got back to our hotels, we decided to call it a night. We were all tired and we had another big day ahead of us tomorrow, a visit to Hoover Dam and The Grand Canyon West. 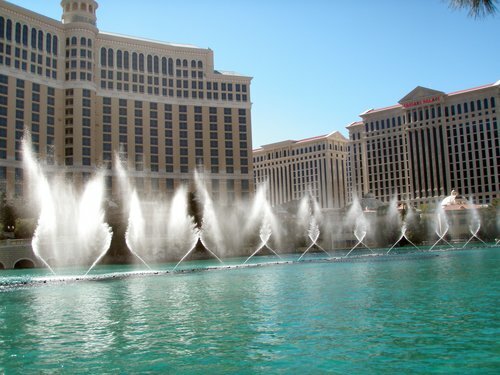 Tagged Bellagio Fountains Las Vegas, cabo wabo resturant, Las Vegas Strip, touristy things to do in las vegas, van halen history. Bookmark the permalink.